Welcome to 2018! As we enter the New Year, many of us are thinking of ways to better our lives. My list goes something like this – exercise regularly, cut down on “screen” time, read more books, spend more quality time with family, and embrace healthy eating habits. Professionals will tell you that integrating small changes into your routine is best for long term success. In the office, as in life, small changes can add up to big impact. The start of a new year is a natural time to reset and refresh setting the tone for a productive year. Because we are in the business of designing interiors and selling furniture, our showroom needs to stay up-to-date with the latest trends involving colors, patterns and textures. As a result, we are constantly updating our space, but like many other small businesses it’s not feasible nor practical to completely renovate every time trends change. You may know that we moved and completly renovated our office in 2012. Here are a few ways to update your space without breaking the bank. 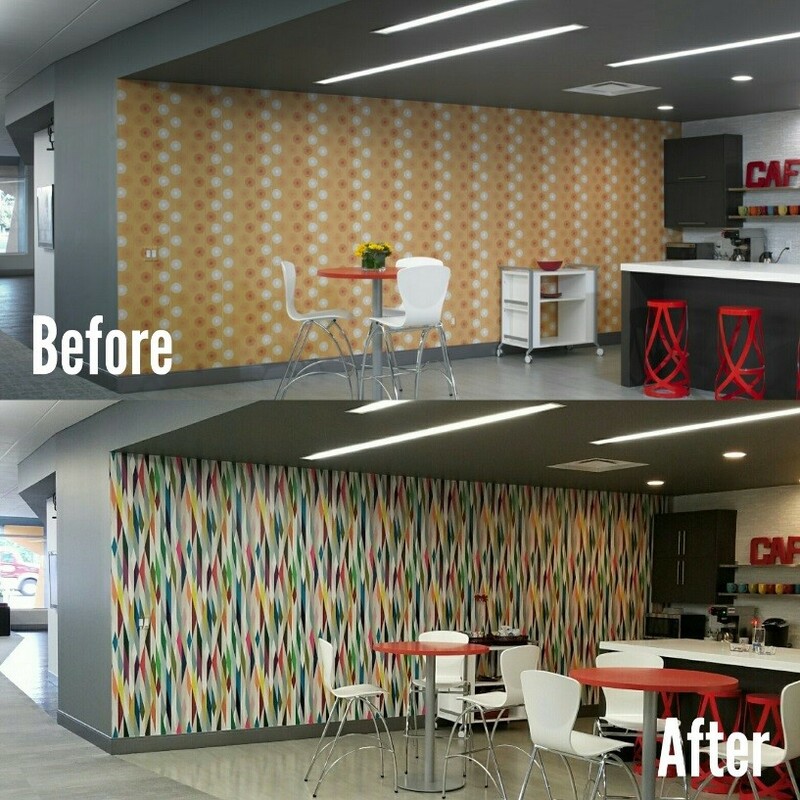 If you’re looking for a fast solution that is more cost effective, there are a multitude of graphic wallcovering patterns that can be purchased “off the shelf” yet can provide a bold look with amazing impact. Below is one of my current favorites, Ink’d by Symphony. It’s offered in a range of colors from subdued neutrals to moody and highly saturated jewel tones. Changing up the general paint color or just adding some new accent colors on the walls can really serve to give you a whole new look. Whether you decide to change one wall or the entire office, the impact will be immediate. And let’s face it, every few years, our walls are ready for a fresh coat anyway – why not change the colors! Adding just one graphic wall can enliven an entire space. Whether you use stock graphics or pursue a custom solution to promote your branding, a graphic wall is great bang for your buck. There are a surprising number of companies offering great images in scalable graphics that can be easily modified to fit. Imagine what either of these spaces would look like without the robust emphasis that this single wall of dramatic color & pattern provides. 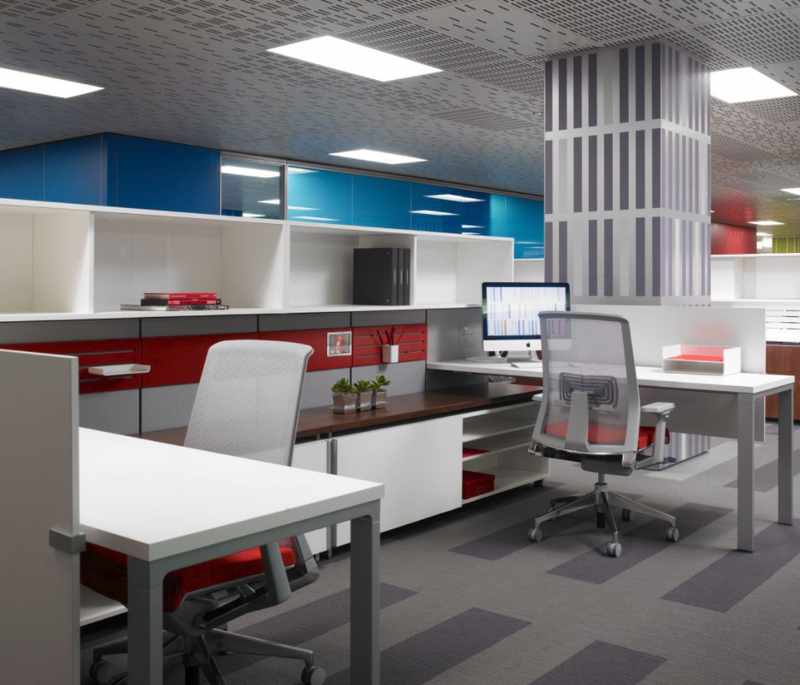 Another strategy we employ is to change up our tackboard and workstation tile fabrics. These components provide an opportunity to inject a bright pop of color and sometimes, pattern, into otherwise neutral territory. The cost for new tackboards or reupholstering existing tackboards is fairly minimal when you consider how this can enhance each office or workstation. If you’re fortunate enough to have purchased Compose workstations by Haworth, you will be pleasantly surprised at how easy it is to order new fabric tiles and surface mounted accessories. Imagine how this space could be transformed with a brightly colored seat pad like red or orange to bring out the colors in the rug. One thing that we routinely do when updating our environment with a new color palette is to replace or reupholster the existing seat pads on our chairs. You would be surprised at how reasonable this can be. We’ve taken our chairs from basic black to brightly colored patterns and it as though we’ve purchased all new chairs. If you replace the entire seat pad, the added bonus is new seat foam, as well! Simply by switching out the tackboards, slat rails, and seat pads, you can see how these workstations could have a whole new look. Change a couple of accent paint colors and you’ve got an entirely different color scheme! The addition of an area rug can completely change the character of a space. They can also serve to delineate space and to communicate that you’ve reached a landing point. Try to conceive of the rooms below without the impact that the rugs lend to the overall space. A note of caution though - be mindful of placement. A thickly textured area rug can pose a trip hazard. Likewise, consider the ease and frequency of cleaning that your rug will require in its designated spot. A more practical solution may be to construct a “rug” out of commercial carpet tile. It is generally low profile and constructed in materials meant for heavy use and frequent cleanings. 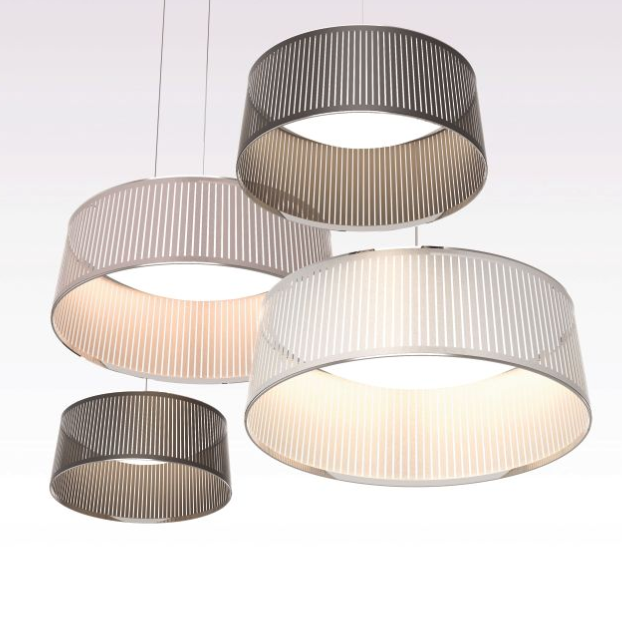 These Caravaggio Matte pendants are available in a variety of sizes and finishes making them a perfect understated addition to any environment. Any one of the Solis Drum fixtures by Pablo Studio & Carmine Deganello would be an elegant addition to an office space. It would be an excellent choice suspended above a small conference table or hung in tandem in an expansive lobby. Lighting is an often over-looked way of adding interest to a space. The cost to add or update a few pendant fixtures is well worth the investment. 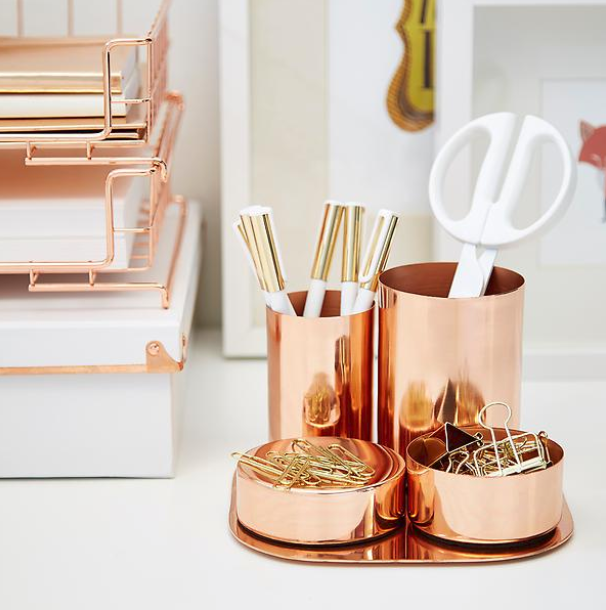 This copper desk set would make a nice addition to any workspace. It would work with so many of the fresh color palettes we’re seeing in fabrics & other materials. I’m a huge fan of whimsy in the workplace so I would love to find the perfect spot for these little Kiwi Birds. The mix of wood & metal appeals to me, as well. We’re seeing so many pastels wander into the commercial products color palette. These stoneware planters would fit right in. With the resurgence of live plants in the workplace, I’m always on the lookout for interesting containers to house them. This Gilded File Holder would be an elegant way to house your active files. I really like these Whisp coat racks by Davis Furniture. Available in a wall-mounted version as well as a freestanding floor rack, it almost functions as a sculptural piece when not in use. Once we’ve completed the majority of our changes, a final sweep through the office is made to address the accessories. Trends and materials change almost as fast as the seasons, and nothing will date a space as quickly as tired accessories. It may have you scratching your head at first, but think of the warmth that could be infused into a space by the addition of a few well-placed pillows. This is the ultimate bang-for-your-buck as even the priciest fabrics become affordable when you just need a yard or so. Incorporating any one of these ideas into your workplace will serve to refresh and revitalize your space. There’s no better time to shake things up, dust off the cobwebs, and send a new message about who you are! Feel free to contact us if you need a little guidance – we’d love to help!